Our last day near Rock bought us another beautifully sunny morning but things were supposed to collapse a tad at some time in the afternoon. 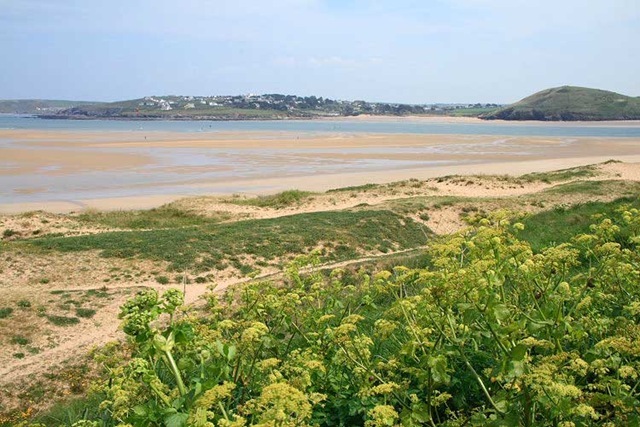 So, we decided to take the ferry across the Camel Estuary to Padstow and walk north the three miles or so to Stepper Point. There was, of course, a brisk breeze blowing and the most interesting sight, for us, was some spectacular kite surfing going on back and forth across the Camel estuary. (Any record that may have been captured of this is on real film – sorry.) We’ve seen a little kite surfing before but not at the level of expertise we saw today. Surfing is one thing, flying a kite is another. Speaking as a total clutz, just how anybody has enough coordination to stay balanced on a surf board whilst remaining in control of a large kite such that they can steer it and go where they intend is completely beyond me. I watched a guy scream towards the shore and, as he approached, cause the kite to lift him out of the water whereupon, in mid air, he deftly kicked the board off his feet before he himself landed gently on the sand barefoot. Quite spectacular. Neither of us felt particularly sprightly for whatever reason today; weary leg syndrome on both our parts, I think. The wildlife did its best to lift our spirits, though. 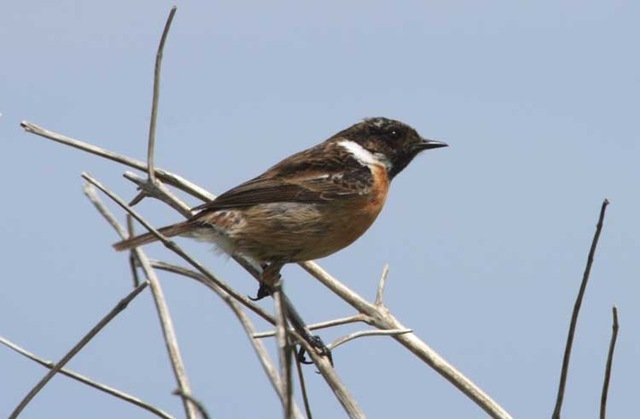 As well as seeing our first swifts of summer, there were lots of stonechats stonechatting away along the shoreline. (Stonechats are so named because their call sounds like two stones clacking together.) They are quite common along the Cornish coast. However, today, one allowed Carol to get close enough with a camera to grab a picture or three. Normally, birds seem to wait patiently as you extract said piece of apparatus, watch bemusedly as you struggle to unbolt one lens in favour of bolting on a longer one, then, just as you raise the laboriously prepared camera to your eye, flap nonchalantly away just before the shutter clicks. The tide was very low and, to get enough water, the ferry was operating a long way out of Padstow at the time of our return trip. It felt as though we were being dumped not far short of Daymer Bay which made our return walk to the car a little longer than anticipated but we seemed to manage to stir our weary limbs into action one last time. They got the weather exactly right, it’s raining now (5:00 PM). On to Taunton to drop in on some friends tomorrow.